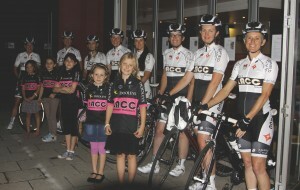 The LACC Women’s team and junior Pixies. I’m particularly happy this week to tell you about a new women’s race team and development squad being launched by my own cycling club – Lidcombe-Auburn Cycle Club (LACC). The new squad is under the leadership of cycling coach and LACC member Donna Meehan and I’m lucky enough to be the Team Manager. Donna who has taken on the role of Directeur Sportif (or team director) describes it as a milestone event for the cycling club. To officially launch the team, an event was held at The Quad Café at Sydney Olympic Park last Friday night. Donna said of the new team and development squad, “LACC has been around for more than 90 years and this is the first time there’s been a women’s race team formed. “By establishing a team we can race together and support each other. But we’re also keen to develop other female club riders and younger women both within the club and beyond. Our overall aim is to support, nurture and encourage female cyclists and to promote women’s cycling which often gets missed alongside the men’s. “This is just a start for us. We know we will need to keep working on it for years to build up the team and development squad. We are really pleased to be supported by some great foundation sponsors including bike company Specialized, bike shop Ashfield Cycles, bike apparel specialist Champion System and my own coaching company Domestique,” added Donna. Many of the eight team members have raced regularly at local, state and national level, and a few have even been to world events. The team members are Donna Meehan, Melanie Reiter, Kim Stokeld, Rebecca Frater, Shiona Will, Sharon Teran, Geraldine Blomfield-Brown and Belinda Diprose. On hand was special guest Kate Bates, who is a former pro-cyclist, Olympian and now SBS commentator is passionate about advancing women’s cycling. It was great to hear Kate speak about how she got her start as a cyclist racing around the Lidcombe-Auburn track as a junior. At the time she was a member of the neighbouring Parramatta Club and she credited the LACC track with getting her started in track cycling. At the start of the event the women arrived by bike (pictured) and showed off their new cycling kit which they will wear for all racing events. The LACC Women’s Race Team and Development Squad is proudly supported by the following organisations (shameless plug I know). Great to see ladies ! The St Kilda Cycling Club formed their first women’s race team four years ago, we should compare notes 🙂 It’s great to see LACC supporting the promotion of women’s cycling !